The irresistible force that sometimes meets an immovable object. At risk of turning this into the “poop blog” [Oh, hey, is there a poop blog? If not, someone needs to start one!] I thought I’d drop this splendid postcard illustration from La Belle Époque. Do you know why they called it “La Belle Époque”? 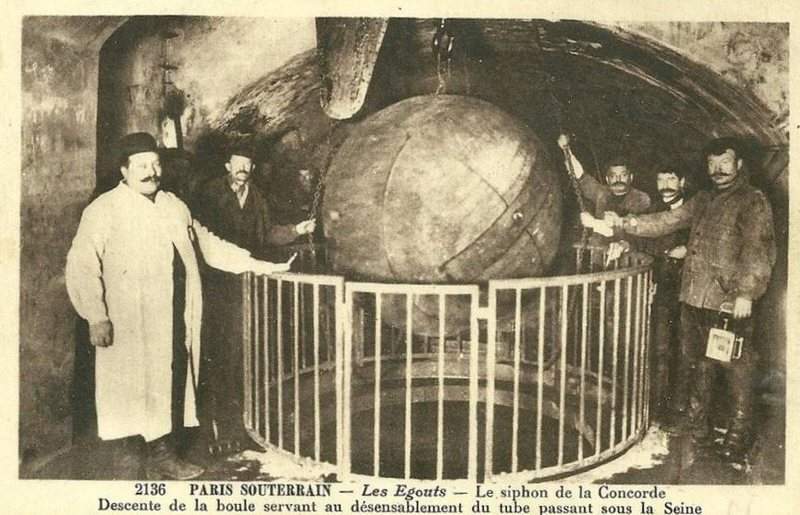 Because Napoleon III’s favorite architect, Baron Haussman, re-designed Paris’ sewers so that the poop stayed below ground and not where people could see it. He made substantial (and expensive!) changes to Paris, including cleaning up the open-air “alyscamps” (Elysian Fields) – Champs Élysées– where all the bodies of the poor dead were tossed to rot. Haussman created what has become another of my favorite Paris spots: the ossuaries of The Catacombs. The glitzy new parts of Paris, once the smell had faded, became the development-site of high-end hotels and stores. It’s similar to Anacostia Flats in Washington, DC or Wall St in New York: reclaimed land becomes high rent because it’s a blank slate. Prior to Haussman, most Parisians drew their drinking water from The Seine river, which runs through the heart of the city. The waste also ran into the Seine. In other words, there was an unfortunate close-proximity recycling feedback loop in place. It’s not hard to see how a cholera epidemic could wipe out an entire city. When I look at Ray Kurtzweil’s “singularity” chart, what I always see is the critical inflection-point on human longevity happened right after Pasteur figured out that bacteria are what make you sick. Human lifespans rocket up, after that. It was a discovery on par with the harnessing of fire or the invention of the screw-driven machinist’s lathe. If you’ve ever cursed Washington DC’s traffic circles and messed-up road plan, you can thank Baron Haussman for that, too. After seeing how the mobs in Paris could effectively blockade the old parts of the city, Haussman designed a modern city layout that would allow effective deployment of artillery in case, you know, invaders. Being a poop pig would be a good post-presidential career for the straw-topped balloon.